Apple iPhone 4S on sale today, plus new iPod touch and iPod nano | What Hi-Fi? 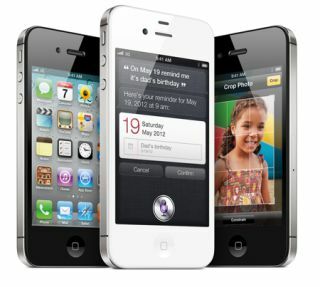 Apple's new iPhone 4S, which it claims is "the most amazing" iPhone yet, goes on sale today. Sim-free prices start from £499 for the 16GB iPhone 4S, with the 32GB model at £599 and 64GB version at £699. Several mobile operators have also released details of their contract deals on the 4s, which is a faster, more powerful and better-specified version of the iPhone 4, although it looks identical. The iPhone 4S uses Apple's latest iOS 5 operating system, which is now available to download for free for iOS devices and has "more than 200 new features". Also new are 8GB versions of the iPhone 4 (£429) and iPhone 3G S (£319), and revamped versions of the iPod touch and iPod nano. The new iPhone 4S features a dual-core A5 chip, which claims to be twice as fast as the iPhone 4, and an 8MP camera with bags of new features including 1080p HD video recording. A key feature is the new Siri voice function, which will answer voice questions, read-out text messages and give voice directions, amongst other features. The 4S can also use Apple's iCloud storage system, which stores all your digital content 'in the cloud' and allows wireless syncing between your computer and all your mobile devices. The iPod touch now starts at £169 for the 8GB model, is available in black and white and comes with iOS 5, access to iCloud and HD video recording. A 32GB model is £249, the 64GB model is £329. The new iPod nano meanwhile now comes with a new multitouch interface, better integrated Nike+ functionality for runners and a starting price of £115 for the 8GB model. A 16GB nano is £129. Meanwhile, the existing iPod Classic (160GB) remains on sale at £199. To see all the new products, check out our Apple blog, and find out more about iOS 5 and iCloud here.